EAGAN, Minn. — Already owning one of the strongest defensive lines in the league, the Minnesota Vikings have made another addition to their front four this summer. Barr was the first player the Vikings drafted after hiring Zimmer in 2014, the ninth overall selection out of UCLA who spent only two years with the Bruins on defense after beginning his college career as a running back. 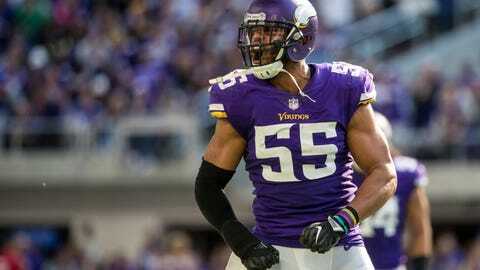 With 10 sacks, six forced fumbles, four fumble recoveries and one interception over four seasons, Barr has left himself plenty of room to improve on such modest statistics. There are many more ways to contribute than those basic measurements, of course, but Zimmer’s matter-of-fact assessment in 2016 that Barr “has a tendency to coast a little bit” still hovers over his trajectory.